GLARE + Professional Polish (12 oz. bottle) Number 1 in The World! NEW GLARE® PLUS +PROFESSIONAL POLISH will make your vehicle’s paint shine so bright that you will literally need sunglasses to look at it during the day, and it will look luminescent under artificial light at night. This product provides the highest shine available with a three dimensional depth of gloss not achievable with any other product. This is brand new technology in paint appearance and protection. Now with more Glassplexin® With More Protection! NEW GLARE® PLUS +PROFESSIONAL POLISH is a non-stick, high gloss, all-weather, temperature- flexible sealant containing a new type of proprietary chemical formulation called Glassplexin. GLARE® was developed by on- staff chemists who have over 100 years of paint-specific chemical experience combined. GLARE® PROFESSIONAL POLISH represents the very latest in paint appearance and protection technology. It contains no waxes, polymers, or resins because those type of ingredients and chemicals in other products have very low melting points and do not filter out UV rays, and do not hold up to regular washing like GLARE®. GLARE®plus + PROFESSIONAL POLISH will bond to your vehicle’s paint through a covalent chemical bond which is not possible with any other product currently available in the world’s market. The chemical reaction that occurs between GLARE® and the paint literally transforms the chemical structure of the vehicle’s paint and now shares the properties of both the original paint and glass. Micro scratches, swirls, and oxidation are all removed permanently. The end result is a newly created type of paint/glass hybrid “SUPER PAINT” that is harder and more resilient then before. The GLARE®Plus + treated paint has a much higher surface tension and causes water to sheet off instead of beading. The newly chemically altered paint now has the ability to filter out over 98% of the sun’s UVA/UVB rays, the ability to block out air oxidation and corrosion, the ability to expand and contract with temperature variances up to 650 degrees Fahrenheit and down to negative 250 degrees Fahrenheit without cracking fading or peeling, will hold up to regular washing, and will block damage from everyday environmental contaminants that always seem to find their way onto your vehicle. Bugs, bird droppings, and tree sap will not stick to paint treated with GLARE® Plus+. Also, GLARE®Plus + PROFESSIONAL POLISH creates a paint surface so smooth and slick that the Air-Drag Coefficient of your vehicle will be significantly reduced, actually making your vehicle more aerodynamic. GLARE®Plus + provides all of these benefits while producing the highest three dimensional depth of gloss never before achievable, and this is why GLARE® Plus + is not only used by individual enthusiasts and collectors, but also by vintage car and motorcycle museums and the world’s most famous professional custom car and motorcycle painters in the industry. This is the absolute finest gloss enhancing polish/sealant currently available in the world’s market for your car, truck, motorcycle, ATV, boat, yacht, personal watercraft, R/V, motorhome, trailer, or aircraft. Never apply carnauba wax, or polymer synthetic wax, on top of your final GLARE® Plus + coat as this will adversely affect the chemical bonding process with the paint and will cause the shine to go down. There is no need to top GLARE® Plus + with anything else because GLARE® provides the highest shine of any other product available. This should always be the final step in any application. GLARE® PLUS + PROFESSIONAL POLISH has been developed to be able to work on a wide variety of car, motorcycle, boat, and aircraft specific paints including Acrylic Enamels, Urethanes, Polyurethane and Polyurethane Clearcoats, and epoxy or polyester resin Gelcoats. GLARE® PLUS +PROFESSIONAL POLISH has been tested and approved by BOEING for use on PPG Aircraft Paint. Glare can be used on Fiberglass, Carbon Fiber, Glass, Plexiglass, Plastic, Chrome, Aluminum, and all metal alloys. NEW GLARE DA Pro Polisher 900 Watts of Power .Variable Speed. 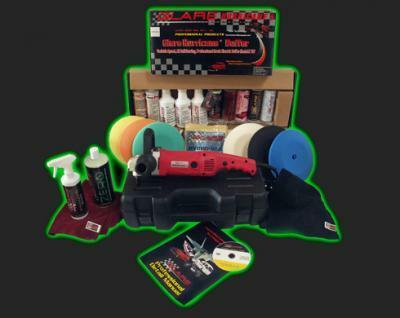 - Summer 2018 Special Pricing With Glare Red and Black Anniversary Buffer Bag Embroidered Logo - Plus a Free Bottle of Glare Polish, and a Glare Micro-Fiber Towel- For a Limited Time Only! 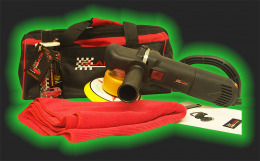 GLARE DA Pro Polisher is one of the finest state of the art, buffing machines in its class and size. Light weight. Very powerful. Easy to use! Gets expert, professional results. No swirls, no buff marks due to the design of the buffing action of this machine. Get the look you want, a Dripping Wet Painted look for any Vehicle. Light Weight and easy to use, even if you never used an electric Buffer before, or your a Pro. This machine is built to take it! A Beautiful Buffer that you will use for all your buffing, and sanding needs. Comes in a special limited edition Custom GLARE Black & Red Utility Bag that holds your Buffer, Pads, and of course your GLARE Pro Polish Products. 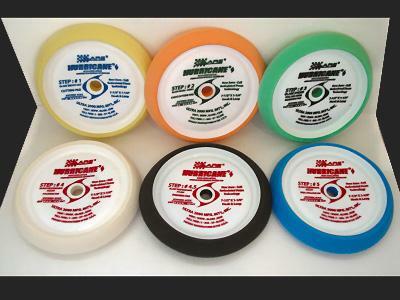 YOU CAN PURCHASE THE 6" BUFFING FOAM PADS ON OUR WEBSITE UNDER BUFFING PADS IN THE CATEGORY SECTION. BE SURE TO USE THE DROP DOWN MENUE FOR THE SIZE 6 INCH. Not included Sanding Disk. Just a Gorgeous and Durable Buffer You will be Proud to own. *SPECIAL PRICE FOR A LIMITED TIME ONLY ! 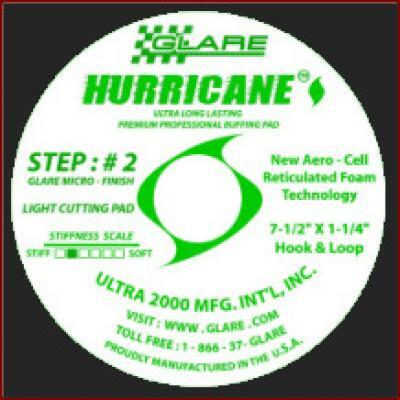 GLARE Hurricane Grand Prix Kit - SUPER Special Get 10% Off Discount Code 5190230 Limited Time Only!! Everything a professional would need! 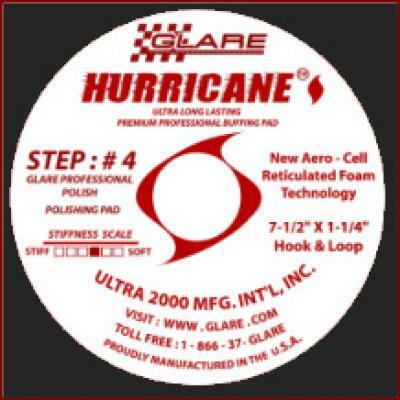 The top of the line GLARE products and kits into one amazing professional bundle One Glare Hurricane Buffer One Grand Prix Premium Kit One Professional Detail Manual and Product Training DVD One of each of our Hurricane Buffing Pads (6 Pads in all) One 16oz. Sahara Wash and Detail Spray One 32oz bottle of ZERO Complete Buff-n-Dry Kit 23 AMAZING GLARE ITEMS!!! 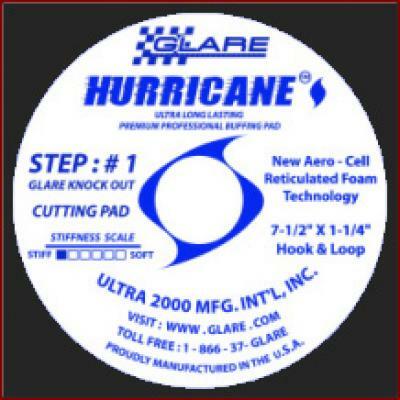 This pad is designed to be used with GLARE Knock Out Compound. The most aggressive pad in the Hurricane line. Removes the highest levels of oxidation and heavy scratches. This is the first step in repairing paint that is in poor condition. 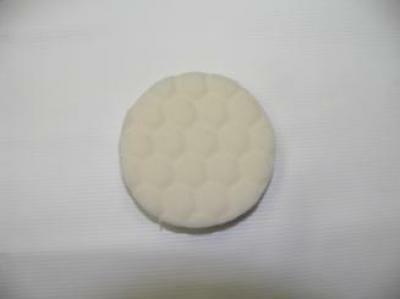 This pad is designed to be used with GLARE Micro-Finish Compound. Removes moderate levels of oxidation and scratches. This is the first step in repairing paint that's in fair condition. This pad is designed to be used with GLARE Pro Polish. Removes oxidaton while polishing at the same time. This pad is designed to be used with GLARE Professional Polish. Delivers a penetrating infusion of Glassplexin Enriched GLARE Professional Polish. Ensures the right amount of friction and deep penetration for a proper Molecular Covalent Bonding of Glassplexin into the paint. This is the first step before finishing. 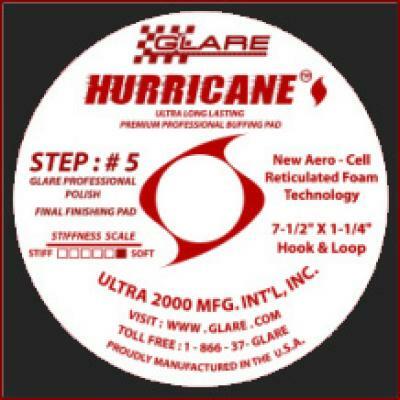 MOTO-GLARE Foam BUFF PAD for MOTO-GLARE BUFFER 4 inch Cordless Electric Buffer unit. 6 buffing pads to a package. (Not sold Individually). 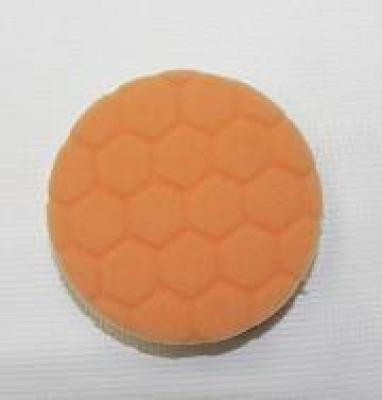 This Pad is used for Polishing. For the Glare 4 inch Cordless Moto-Glare Electric Buffer unit. 6 buffing pads to a package. (Not sold Individually). 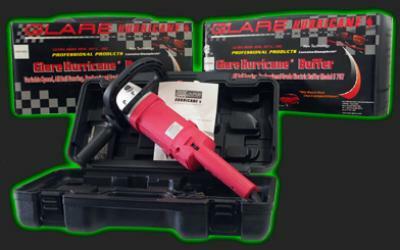 All Sales are final on Glare Buffing machines, buffing pads, and Micro-Fiber towels. Factory warranty still applies where applicable.